Select the Edit tab in Styles. Select the Edge panel in the Edit tab; it's the one on the far left that looks like a wireframe box. In the Color drop-down menu, switch from All Same to By Material. Use the Paint Bucket tool to paint your edges whatever color (or colors) you choose. 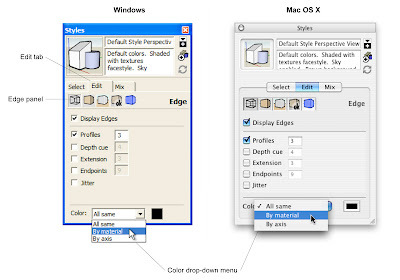 Keep in mind that because the By Material edge color setting is technically part of Styles, and most Styles use the All Same setting, your edges will usually go back to being all-black if you apply another Style. Don't despair – your edges appear black, but SketchUp remembers what color you chose to make them. All you have to do is follow the above steps to switch back to By Material and you'll be all set. Update Added an image to make things clearer. Thanks once again for a great tip. I discovered a couple of weeks ago that you can assign the axis colors to edges (very useful for solving face creation problems), but I never thought to look at the color by material option. It works much better than turning edges off, which is what I'm used to doing. Basically we look at edge colour driven from the layer dialog and then set edged by material. I just added an image to clarify things a bit. this can be useful when exporting 2d dwg files into cad. This can help you separate certain elements of your drawing once in cad, using selection filters, to select elements by color. For example, railings, elements you want to appear in hidden lines, furniture, etc. If you export your dwg with color by material, those colours will remain in the resulting dwg. for those who wish to make an effect on edges but i favour the EDGE BY MATERIAL and Color by layer export to cad process better. We have seen many users painting edges individually and they get into a mess when they get bogged down on edge colour painting on complex models. Color drop-down menu at the bottom of the Edge panel, in the Edit tab of the Styles dialog box is what is most efficient. Fast and effective - Seem users paintingmaterials onto edges with teh paint bucket - NOOO. YOU HAVE THE STYLE BUILDER NOW! and simple sketchycad tools then the world will ddefinately be a much better place - com on SketchUp..